Military science fiction is a sub genre of science fiction where interstellar or interplanetary conflict and its armed solution (war) make up the main or partial backdrop of the story. Such war is usually shown from the point of view of a soldier. 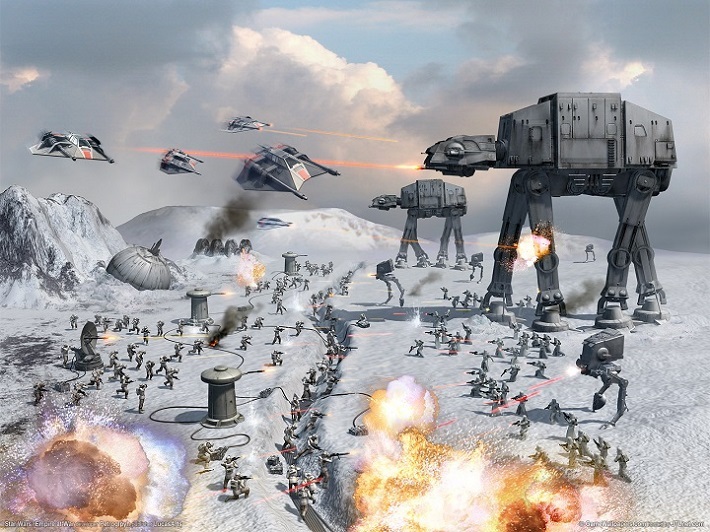 In general, a detailed depiction of conflict forms the basis of most works of military science fiction. The main characters are often part of the military chain of command. Frequently, the conflict is assumed to be inevitable (humans vs. aliens, democracies vs. dictatorships, aliens vs. aliens, etc. ), and the military approach is not questioned. However, in a significant number of such works, the problem of ending an intractable conflict is dealt with, and in such works the conflict is often shown to have been pointless originally. Examples include David Drake's Counting the Cost, Joe Haldeman's The Forever War and Alan Moore's The Ballad of Halo Jones. Traditional military values (discipline, courage, etc.) are usually stressed, and the action is often described from the point of view of either a soldier or officer. Technology is generally advanced and often described in detail; however, in some stories technology is fairly static, in some cases using weapons that would be familiar to present-day soldiers, and wars are not primarily won by R&D or even logistics, but by willpower and military virtues. In other stories technological changes are central to plot development. Another common characteristic is the use of actual historical battles or conflicts as more or less direct models for fictional situations. A few such events have been re-used often enough to become cliched, such as the battle of Rorke's Drift or the Nika riots. Often starships are classified as in the Washington Naval Treaty of 1922: heavy and light cruisers, etc. Thus, while the original Star Wars movies have an armed conflict as backdrop, they would not usually be considered military SF. Most Star Trek series are not part of this genre, though Deep Space Nine borrows some of the genre conventions in later seasons. Similarly, Babylon 5 is a borderline case. Space: Above and Beyond is clear military SF, but the Lensman cycle by E.E. Doc Smith is not considered so, being instead seen as Space Opera. Perhaps the first works of modern military SF were H. Beam Piper's Uller Uprising (1952) (based on the events of the Sepoy Mutiny) and the same author's Lord Kalvan of Otherwhen (1965). Robert A. Heinlein's Starship Troopers (1959) is another pivotal early work of military SF, and mostly responsible for spreading this sub-genre's popularity to young readers of the time. The start of military SF as a recognized sub-genre might be placed at the publication of Combat SF in 1975. This anthology includes one of the first Hammer's Slammers stories by David Drake as well as one of the BOLO stories by Keith Laumer, and one of the Berserker stories by Fred Saberhagen. This anthology seems to have been the first time SF-stories specifically dealing with war as a subject were collected and marketed as such. Shortly afterwards, the book publication of Jerry Pournelle's The Mercenary (1977, first section published in Analog Science Fiction in 1972) and of Drake's "Slammers" series (1979) established the sub-genre as an active marketing category. The series of anthologies under the group title There Will be War edited by Pournelle and John F. Carr (nine volumes from 1983 through 1990) helped keep the category active, and encouraged new writers to enter it. While military science fiction, like science fiction in general, is primarily for entertainment purposes, a number of authors have presented stories with political messages of varying types as major or minor themes of their works. A growing tendency in some quarters of military SF is to portray democratic government with a certain level of contempt, as bloated, inefficient or even openly antagonistic to its military protectors (who as the protagonists are typically portrayed as good and noble in this type of story) and liberals as out-of-touch ivory tower academics and idealists who must invariably be protected from themselves. Some works in the genre openly admit they have been written to transport certain present-world political messages. For example, Tom Kratman's and John Ringo's "Watch on the Rhine", infamous for its plot where rejuvenated Waffen-SS personnel are used to defend Germany against an alien invasion, includes an epilogue explaining that this serves as a metaphor for the "ruthlessness" that, according to the authors, must be brought out in today's Western civilization to successfully win an ongoing global conflict. Military SF has also been and continues to be written from liberal viewpoints and works like Joe Haldeman's The Forever War, which indirectly criticizes the military, are not unknown. David Drake, not in any way an anti-military author, has often written of the horrors and futility of war. He has said, in the afterwords of several of his "Slammers" books, that one of his reasons for writing is to educate those people who have not experienced war, but who might have to make the decision to start or support a war (as policy makers or as voters) about what war is really like, and what the powers and limits of the military as a tool of policy are. In more recent books, David Weber's Honor Harrington series, while previously featuring righteous heroes triumphing over despicable villains, now centers on an unnecessary war between two groups of positive characters.